Army exhibition in Tehran's square! i am really busy for next days so i donot think i could update here in short periods. anyways i think it was intersting for you to see some picture from my city Thehran . 1-after 30 days war between Israel and Hezbollah poster and billboards of nasrallah covered all of the city. 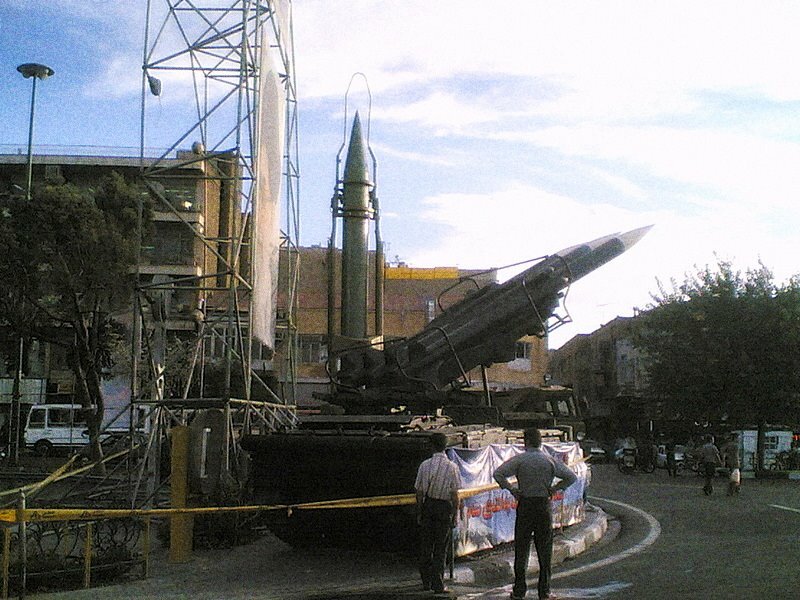 2-in anniversary of Iran Iraq war these rockets and missiles are exhibit in one of big square of Tehran . 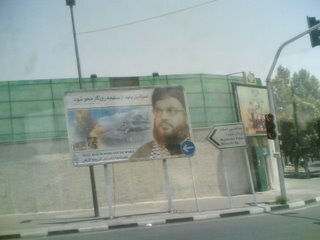 so stop trying to guess that Iran is preparing for a new war! I really don't know how many times I wrote a post about censorship and restriction of freedom of expression in Iran what that really I suffer about it and upset me more than everything in Iran. Their attitude is really strange usually for a period of time the leave everything by its own and these days their attack is begin again. 1-they come to our house and ask us to give them our satellites and if we refuse their request, hard punishment is waiting for us. 2-they crack down another newspaper. Shargh most prominent reformist newspaper was crack down yesterday .they close our newspaper which we used to read it every day but today my only choices in news station were governmental newspapers. 3-tonight a subtitle rolls on bottom of our TVs. it was a government statement about Iranian cinema, exactly the day after cinema national day in Iran. The statement says from today movie producers shouldn't advertise their movies on satellite channels Otherwise they banned the movies! They filtered hundreds of sites only if views have little different with official views. They are restricted us on Internet with slow dial ups lines. It is a secret policy in Iran.”High speed lines are only sufficient for government offices or big company. We must restricted people as more as we could so we try the keep expensive charge of using Internet. Iran former president Mohammad Khatami allowed to enter united state without any insulting acts (like fingerprinting) that U.S behave with citizens of unfriendly countries . In Iran hardliners called him traitor becouse of his trip , and in the united state many official like governor and senators called him as former leader of a terrorist county . maybe it was good if I mentioned that Mr khatami have most votes of iranian people as a president ,23 milion vote in first round in front of 9 milion votes of president ahmadinejad in first round(and 17 milion in second round) .Mr khatami also known as an religious intellectual in the many countries. With all of these facts , what do you think about objections in Iran and U.S to him about his trip? why hardliners in Iran (supporters of Mr ahmadinejad) called a traitor or what kind of persons in U.S could write article like this?